Open the ladyfingers and separate them. Strain the frozen berries over a bowl, reserve juice. Combine defrosted raspberries with sliced strawberries and blackberries. Line 4 martini glasses with a single layer of ladyfingers, letting the cakes overlap a bit at the stem. Press the cakes down a bit to fit the lines of the glass. Paint the ladyfingers with raspberry juice, liberally. Beat cheese with cream and sugar on low, 2 minutes. 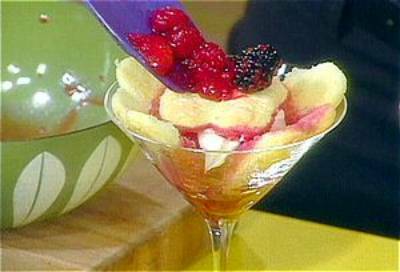 Spoon berries, then sweetened mascarpone into glasses. Top glasses off with a cap of the ladyfingers dotted with berry juice and more mixed berries.